SAN MATEO, Calif., and ZARAGOZA, Spain—October 20, 2015—Libelium has added Sigfox wireless connectivity to its portfolio of Waspmote OEM and Waspmote Plug and Sense! sensor devices, to speed development of Smart Cities and Internet of Things (IoT) projects that require low-energy, long-range wireless data transmission on the Sigfox global network. The Waspmote platform now offers a dozen connectivity options available off the shelf, and integrates more than 100 sensors. Both lines of Waspmote sensor devices are “SIGFOX Ready™ Class 0”, the certification ensuring maximum performance wherever the Sigfox global network is available. Currently, the Sigfox network is deployed in ten European countries and is slated to cover major U.S. cities, including Boston, Los Angeles, New York and San Francisco, by Q1 2016. 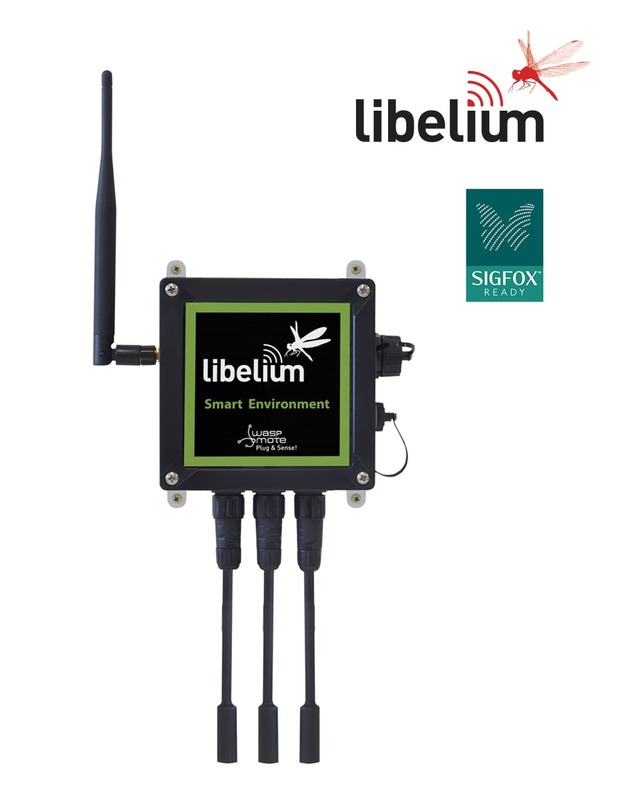 Libelium’s Sigfox module is now fully integrated in the Waspmote sensor platform and is also available for customers as an add-on to upgrade existing Waspmote devices. The Waspmote OEM line allows developers to prototype a wide range of applications; Waspmote Plug & Sense! devices offer easy network configuration for applications such as Smart Cities, environmental control, or parking. “Modularity, scalability, and interoperability are key to building the IoT. Specialized narrowband connectivity via Sigfox can give an immediate solution for many IoT and Smart Cities use cases, where wireless sensors need to be autonomous and transmit over long distances,” said David Gascón, Libelium CTO and co-founder. “We are deploying a global network that makes it simple to connect devices anywhere in the world—and monetize the data from those devices,” said Stuart Lodge, Sigfox EVP of global sales and partners. “We welcome Libelium into our open partner program; their innovative sensor devices will accelerate the development of industrial applications and business”. Waspmote Plug & Sense! and OEM product lines are certified “SIGFOX Ready™ Class 0”. Many Smart Cities and Industrial IoT applications require low bandwidth data transmission over distances, often in areas of high electromagnetic interference. This level of certification means that all Libelium sensor nodes offer the maximum coverage range possible on Sigfox global networks—up to dozens of kilometers, even in crowded wireless environments. Embedded radio module in Waspmote sensor nodes sends information directly to Sigfox base stations. Fast response, and simple, immediate network setup. The network works in a similar way to mobile operator networks – no SIM card is needed. Infrastructure costs are reduced for IoT and Smart Cities deployments. Because data are directly routed through the Sigfox Cloud, there is no need for application-specific networks or servers. Waspmote sensor devices can automatically redirect data to a private database or Cloud. Information can be retrieved using standard Web calls and secure API keys. Secure IP connection assured between devices, base stations, and Cloud servers. Accounts activated with strong, unique API keys. Secure authentication maintains data integrity, and privacy of the information sent by the sensor nodes through the base stations and to the Cloud. Sigfox Ready™ Waspmote OEM and Plug & Sense! extensive documentation and tutorials. Waspmote is a complete technology platform for the IoT, integrating any sensor, any communication protocol, and any Cloud system. Waspmote OEM is oriented to developers for prototyping, pilot projects and proofs of concept; The Waspmote Plug & Sense! sensor line is configured for quick deployment of IoT services and applications. For more Technical information go to Waspmote and Plug & Sense! website, or read the Sigfox Technical Guide . Know Sigfox application in our case studies.